Discussion in 'HOWTO-Related Questions' started by Nap, Oct 8, 2006. I have a W2K server running with a number of folders shared. I have gnome installed on my Debian machine (since I am new to Linux) and I used Falko's wonderful install guide to get the basic LAMP services running. I then installed ISPConfig. When I use the File Browser in Debian, I click on the "Network" icon, then click on the "Windows Network" icon, and then click on the "abmsdomain" icon (my LAN domain name). 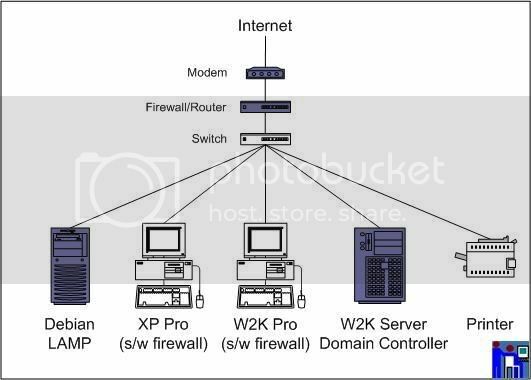 You do no have the permissions necessary to view the contents of "Windows Network:W2Kserver". I've had access to the shares on that machine in the past. I used the file sharing to move the ISPConfig-2.2.6.tar.gz from my windows machine onto my Debian machine. I am wondering what I need to do to get it working again. For the M$ people here, I have also added the Debian machine to the "Active Directory Users and Computers". This is a big problem for me since I can't use my browser to download files because the browser hangs my machine. I know it's not a password issue (though it's possible that it could have something to do with PAM, but I don't think so). I'm not saying that installing ISPConfig broke my file access, but it was working before I installed it. So it has to be related to a setting I've made wrong somewhere. As far as i know to have access to Windows machines you have to install SAMBA client on your Linux machine. If you want that Windows machines have access to your Linux machine, you'll need SAMBA server as well. I also think that's important that the Windows and Linux machines are a member of the same domain. Do you use SAMBA already? Also, I haven't configured Samba at all. Still trying to get the www functions going, HTTPS is where I'm stuck atm. But it was working before I setup ISPConfig. I used the file sharing to connect to my windows machine and xfer the ISPConfig tar.gz file. I just started reading the Samba How-To (for Ubuntu) and noticed that it's talking about setting up Samba as a domain controller. I already have a domain controller, the W2K Server is performing that function. Could that be the source of my problem? Two master controllers conflicting? Maybe it's a firewall issue? Did you enable ISPConfig's firewall? no. I've left that off. Which to me looks like there are no entries. There is a firewall seperating my LAN from the Internet, and I have a s/w firewall on my Windows client that I'm accessing this forum from. From the Debian machine's point of view, there is no firewall between it and the Windows 2K Server, and my LAN does not use any sub-nets. I've got ISPConfig working now (and can browse the sites I create, using HTTP & HTTPS). So I need to get the file sharing working so I can now load all the PHP, HTML, etc onto the Linux machine. and I have a s/w firewall on my Windows client that I'm accessing this forum from. What happens if you switch off your windows firewall? Does it work then? That machine is not involved in the communications. The problem I'm having is between the Debian machine and the W2K Server, neither of which have a firewall running and are both on the same sub-net.